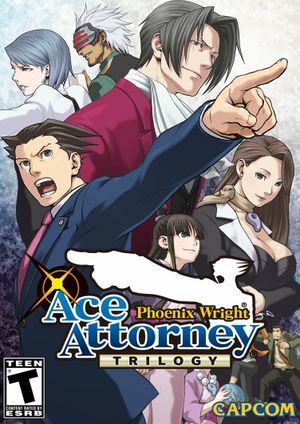 Remastered version of Phoenix Wright: Ace Attorney, Phoenix Wright: Ace Attorney: Justice For All and Phoenix Wright: Ace Attorney: Trials and Tribulations, which hadn't previously been released on PC outside of Japan. Animations play too fast, disable V-Sync for proper animations. Running the game on a monitor with higher refresh rate than 60hz will cause the animations and text to run at much higher speeds. Fixed by limiting monitor refresh rate to 60hz. ↑ 1.0 1.1 File/folder structure within this directory reflects the path(s) listed for Windows and/or Steam game data (use Wine regedit to access Windows registry paths). Games with Steam Cloud support may store data in ~/.steam/steam/userdata/<user-id>/787480/ in addition to or instead of this directory. The app ID (787480) may differ in some cases. Treat backslashes as forward slashes. See the glossary page for details. This page was last edited on 23 April 2019, at 01:20.